This chapter describes initial procedures that can help you diagnose a computer problem. These procedures can often reveal the source of a problem or indicate the correct starting point for troubleshooting the computer. Dell recommends that you perform these initial procedures in the order they are presented. 1 Ask the user to back up any data on the hard-disk drive if the computer's condition permits. See the "Maintaining Your Computer" section of the online System User's Guide. 2. Ask the user to try to duplicate the problem by repeating the operations he or she was performing at the time the problem occurred. Can the user duplicate the problem? No. Proceed to the next section, "Visual Inspection." 3. Observe the user to determine whether he or she is making an error, such as typing an incorrect key combination or entering a command incorrectly. Is the problem a result of user error? Yes. Instruct the user in the proper procedure or direct him or her to the appropriate user documentation for a description of the correct procedure. CAUTION: Before you proceed with the visual inspection, ensure that the user has saved all open files and exited all open application programs if possible. The visual inspection consists of a quick inspection of the exterior of the computer and any attached peripherals, including making any necessary corrections. For information about the proper removal and installation of computer components, as instructed in the following procedure, see Chapter 4, "Removing and Replacing Parts." 1. Determine the power state of the computer. If the system is on, go to step 2. If you are unsure whether the system is on, shut down and restart the system, and then go to step 2. 2. Turn off any attached peripherals, and then shut down the computer. 3. 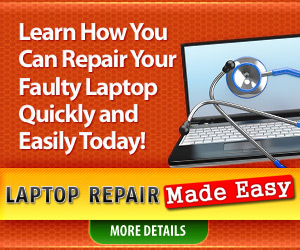 Verify that the exterior of the computer is free of any obvious physical damage. a. The AC adapter's AC power cable is connected to both the AC adapter and the electrical outlet. The AC adapter's indicator light should be on. b. The AC adapter's DC power cable is properly connected to the computer's AC adapter connector. c. The AC adapter and cables are free of any obvious physical damage. 5. If the computer is operating from battery power, remove any installed batteries, verify that they are free of any obvious physical damage, verify that the connectors on the battery and inside the battery bay are not damaged, and then reinsert the batteries into their respective compartments. Press the test button located on the back of each battery to make certain that there is a charge. 6. Remove any installed device from the options bay, verify that it is free of any obvious physical damage, verify that the connectors on the device and inside the options bay are not damaged, and then reinsert the device into the options bay. 7. Remove any installed PC Cards from the PC Card slot, verify that they are free of any obvious physical damage, verify that the connectors on the PC Cards and inside the PC Card cage are not damaged, and then reinsert the card(s) into the PC Card slot. 8. If there is a memory area problem and the computer has memory modules, remove the memory modules from the bottom of the main board, verify that they are free of any obvious physical damage, verify that the connectors on the modules and in the memory module sockets are not damaged, and then reinstall the modules. 9. Raise the LCD display and verify that the computer is free of any obvious physical damage. 10. Verify that the keyboard is free of any obvious physical damage and that its keys operate freely. 11. Verify that the touch pad operates freely. a. The monitor's interface cable is properly attached to the external-monitor connector on the computer's I/O panel. b. The monitor's power cable is attached to an electrical outlet and is free of any obvious physical damage. c. The monitor, its interface cable, and connectors are free of any obvious physical damage. d. The monitor is on. e. The monitor's controls are set according to the instructions in the documentation for the monitor. a. The mouse is properly connected to the keyboard/keypad/mouse connector on the computer's I/O panel. b. The mouse, its cable, and connectors are free of any obvious physical damage. c. The mouse's ball and pushbuttons operate freely. a. The device's interface cable connector is correctly attached to the appropriate port connector on the computer's I/O panel. b. The captive screws that secure the connectors at each end of the interface cable are secure enough to ensure a firm connection. c. The attached device, its interface cable, and connectors are free of any obvious physical damage. 15. Turn on any attached peripherals and then the computer. Does the problem recur? Yes. Go to the next section, "Observing the Boot Routine." No. No further steps are necessary. After you perform a visual inspection as described in the previous section, boot the computer from a diagnostics diskette and, while the boot routine is running, observe the computer for any indications of problems. NOTE: To prevent possible damage to the original diagnostics diskette, always use a backup copy of the diagnostics diskette when servicing a user's computer. Dell recommends that users make copies of the Dell Diagnostics Diskette. For instructions, see "Before You Start Testing" in Chapter 4, "Running the Dell Diagnostics, " of the Dell Inspiron 3500 Portable Computer Reference and Troubleshooting Guide. 1. Turn off the computer and any attached peripherals. 2. Insert a diagnostics diskette into the diskette drive. Turn on all peripherals and then the computer. 3. Observe the indicators at the front of the keyboard. Depending on how the computer is configured, after various indicators flash momentarily in the status display panel, some indicators should light up and remain on. Do these indicators light up within seconds after the boot routine starts? No. Troubleshoot the power subsystem. These indicators light in response to data being transferred to or from the drives. If either of these indicators fails to light during the boot routine, troubleshoot the diskette drive or hard-disk drive subsystem, as appropriate. A beep code is a series of beeps that indicates an error condition. If the computer emits a beep code, refer to Table 3-1. NOTE: The computer beeps once shortly after the system boots. This beep is normal and not part of a beep code. These messages can indicate problems or provide status information. If a system error message is displayed, refer to Table 3-2. 5. Observe the display for the Diagnostics Menu of the Dell Diagnostics. Does the Diagnostics Menu appear on the display? Yes. See "Running the Dell Diagnostics" in Chapter 3. No. Go to step 6. 6. Insert another copy of the diagnostics diskette into the diskette drive and reboot the computer. Does the Diagnostics Menu appear on the display? Yes. See "Running the Dell Diagnostics" in Chapter 3. No. Go to the next section, "Eliminating Resource Conflicts." Devices within or connected to the computer may require dedicated memory spaces, interrupt levels, and/or DMA channels. Because different devices can be configured at different times, it is possible that the same resource is assigned to two or more devices. Disconnect all peripherals and remove all PC Cards to make sure that the computer failure is not caused by faulty devices. If you suspect that resource conflicts might exist, check the computer and reassign the resources as necessary. For more information about resolving conflicts, see Chapter 3, "Troubleshooting Your Computer," in the Reference and Troubleshooting Guide. If none of the procedures in this chapter reveal the source of the problem or lead to the proper troubleshooting steps for determining the source of the problem, contact Dell for technical assistance. For instructions, see Chapter 5, "Getting Help," in the Reference and Troubleshooting Guide or the "Contacting Dell" section of the online System User's Guide.